I'm hoping this will become a common practice in Hollywood - to adapt "children's tales" into more sophisticated features. Last month, Spike Jonze gave us the wonderful and complicated Where the Wild Things Are, and now Wes Anderson takes his first stab at animation with Fantastic Mr. Fox, which, like the latter, is based on a children's literary source with deeper-than-expected themes. Ultimately, Mr. Fox plays more as an irreverent comedy than a family drama, but even so, kids and adults will find they can like it for similar and different reasons. 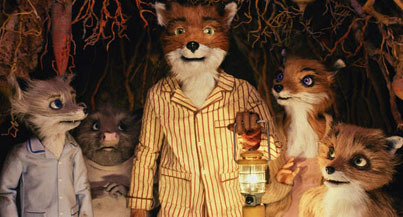 Based on the novel by Roald Dahl, the film tells the story of Mr. Fox (voice of George Clooney) and his various misadventures after he decides to steal chickens, geese and cider from the three farmers near his house. He tells his wife, Mrs. Fox (Meryl Streep), "I'm sick of being poor," and enlists the help of his friend Kylie (Wallace Wolodarsky) and nephew Kristofferson (Eric Chase Anderson) to help him carry out his missions. Of course, he doesn't tell Mrs. Fox (she thinks he's just some newspaper columnist) and his ambitions blind him to the quirky developments of his awkward son, Ash (Jason Schwartzman), who wants so bad to be an athlete like his dad and cousin. After a few successful jobs, the three farmers - Boggis, Bunce and Mean - grow wary of Fox's methods and attempt to blast him out of his tree house with shotguns and bulldozers, forcing Fox and the surrounding creatures to escape underground. Everyone grows dependent on Fox, now tail-less, to save them and restore order to the animal community, who apparently have a whole civilization outside of the human race, complete with their own schools, economy, and factories for things like clothes and appliances, although this dichotomy is never fully explained.